The aim of this qualitative study was to address the lack of consensus on the current cyberbullying definition and the limited research on definitions of cyberbullying made by emerging adults in Australia. Six focus groups were conducted with a total of 39 participants aged 18 to 25 years. The focus groups used a semi-structured question protocol to gain a deeper understanding of emerging adults’ perceptions, observations, and opinions related to cyberbullying. A thematic analysis revealed that participants perceive cyberbullying to be an extension of traditional bullying comprising similar key components (i.e., intent to harm, repetition, and power imbalance). However, despite a consensus on the components involved, the operationalization of these key components differed among participants depending on whether they adopted a perpetrator, target, or bystander perspective. The current study extends on previous research by focusing on the different perspectives of cyberbullying (i.e., perpetrators, targets, and bystanders) rather than assuming a single perspective, and in turn integrating these perspectives to propose a multifaceted definition of cyberbullying. Cyberbullying has been the subject of intense media scrutiny around the world, largely due to the serious negative effects it can have on victims (Mason 2008). There has been a dramatic increase in cyberbullying research over the past decade, with most studies focusing on the definition, measurement, prevalence, and correlates of cyberbullying (Cassidy et al. 2018). Yet, in spite of a growing body of research, there is still no unequivocal definition of what constitutes cyberbullying (Bauman et al. 2012; Corcoran et al. 2015; Olweus and Limber 2018; Patchin and Hinduja 2010; Vandebosch and Van Cleemput 2008). It is generally agreed upon that cyberbullying is considered an extension of traditional bullying in which intention, aggressiveness, power imbalance, and repetition are core features. There are, however, some important differences between traditional bullying and cyberbullying (Smith 2019; Vandebosch and Van Cleemput 2009). For instance, the repetitive behavior that defines traditional bullying (i.e., more than once or twice) may need to be reconceptualized for cyberbullying. While it is relatively straightforward to establish cyberbullying in direct repetitive attacks (e.g., multiple abusive text messages), a single episode of traditional aggression that would have previously been constrained to a particular time and place is no longer constrained in cyberspace. Aggressive content directed to a target can now be posted as a comment, photograph, or video-recording by a perpetrator in a single action, but this content can be repeatedly viewed, shared, saved, commented on, or “Liked” by others, and result in a cycle of repetition of the original aggression and associated ongoing damage or trauma for a victim who re-lives the experience (Dooley et al. 2009; Langos 2012; Patchin and Hinduja 2015; Slonje and Smith 2008; Vandebosch and Van Cleemput 2009). The power imbalance feature of traditional bullying is often based on physical strength, but in the online world, power is more about having advanced technological knowledge and keeping one’s own identity unknown (Langos 2012; Patchin and Hinduja 2015). Although there are forms of traditional bullying where the perpetrators can remain anonymous, most forms involve direct interaction between perpetrator and target. In spite of the considerable discussion on how cyberbullying should be defined, most of the research on cyberbullying has nevertheless utilized adapted versions of the traditional bullying definition and these definitions have primarily been proposed by academic researchers without seeking the perspectives of potential perpetrators, targets, or bystanders of cyberbullying. That is, cyberbullying researchers have implicitly defined cyberbullying through their choice of questions used in self-report questionnaires that purport to measure levels of cyberbullying. These questionnaires often include either one-item scales where a global definition of cyberbullying is used or multi-item scales that list behaviors assumed to be indicative of cyberbullying (Menesini et al. 2011; Vandebosch and Van Cleemput 2009). However, it is not clear whether researchers and individuals who complete these questionnaires share the same understanding of which particular behaviors should be considered cyberbullying (Corcoran et al. 2015; Nocentini et al. 2010; Vandebosch and Van Cleemput 2009). It should also be noted that similar issues also remain unresolved in the traditional bullying literature, with past research reporting a discrepancy in how students, teachers, parents, and researchers define bullying (Campbell et al. 2018; Demaray et al. 2013; Maunder et al. 2010; Naylor et al. 2006; Sawyer et al. 2011). 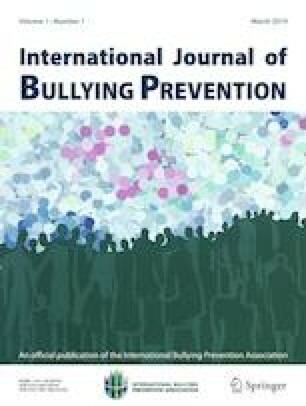 As such, there is a need for researchers to clarify how specific populations define cyberbullying and its associated behaviors in order to ensure that findings related to cyberbullying are meaningful both in terms of further research, but more importantly in terms of providing effective interventions. Due to the problems surrounding the definition of cyberbullying, researchers have also experienced difficulties operationalizing the term and thus providing accurate estimates of the prevalence of cyberbullying (Vandebosch and Van Cleemput 2008; Whittaker and Kowalski 2015). For instance, self-report questionnaires tend to use closed-ended response formats such as dichotomous choices and Likert scales, which means that respondents are constrained to response options that are provided by researchers without being able to elaborate on their experiences, views, or interpretations (Li 2007; Menesini et al. 2011; Smith 2019). The underlying assumption of these self-report questionnaires is that victims of cyberbullying who report being victimized more frequently are also cyberbullied more severely. However, it is plausible that one severe attack has more of a negative impact than multiple mild attacks (Dredge et al. 2014; Menesini et al. 2011; Schenk and Fremouw 2012). In other words, cyberbullying may be better captured by words and not numbers (Smith 2019; Vandebosch and Van Cleemput 2008). Therefore, using a qualitative research design and using qualitative data to inform the future development of quantitative instruments, appears to be a more appropriate methodology to use in order to capture the phenomenology of cyberbullying. Much of the research on cyberbullying has also primarily focused on adolescents, with little attention in the literature on emerging adulthood. The heavy focus on adolescents in cyberbullying research is said to be due to the various risks associated with this stage of development and identity formation (Francisco et al. 2015; Li 2007). However, it is argued that although identity formation begins in adolescence, the period of emerging adulthood is when this process is magnified where emerging adulthood refers to the stage after adolescence and before young adulthood (i.e., 18–25 years old; Arnett 2000; Wood et al. 2018). It is during this stage of development where individuals often have to adjust to changed living conditions, such as moving out of the family home and away from friends and in turn can lack social support and suffer from isolation (Tennant et al. 2015; Wood et al. 2018). The changed status from secondary school student to emerging adult can bring on anxiety with the perceived demands that this developmental stage brings. For instance, this is where individuals start to become independent in relation to financial and residential status and use the Internet to access government information and services (my.gov, Centrelink, tax, visas, passports, etc.). Emerging adulthood is also where texting and social media use is a common part of social communication, and these media are no longer being supervised by parents or teachers. Emerging adults are known to be heavy users of mobile phones, computers, and other networked mobile devices as part of their personal, academic, and professional lives (Agatston et al. 2007; Arıcak 2009; Boulton et al. 2012; Campbell et al. 2012; Cassidy et al. 2018). For example, university students require computers and the Internet to complete their studies (i.e., research, student email, online portals, and submissions), and many employees in the workforce are required to use a computer or mobile device as part of their professional duties. Yet, surprisingly, there is limited research on cyberbullying during emerging adulthood despite estimates reporting around 20% of college students have been cyberbullied (e.g., Kowalski et al. 2012; Kowalski et al. 2017; MacDonald and Roberts-Pittman 2010). Of the limited research that has been conducted using samples of emerging adults, college students have described the definition of cyberbullying as ambiguous, outdated, and misleading (Baldasare et al. 2012; Crosslin and Golman 2014). Therefore, while it is argued here that cyberbullying during this developmental period may be a serious problem that requires further research, it is crucial that researchers gain a clearer understanding of what cyberbullying means to emerging adults before appropriate strategies and interventions can be recommended. The current study is the first to our knowledge to conduct a qualitative study on how emerging adults in Australia define cyberbullying. The aim of this study is to address the gaps in the literature by taking a step back from investigating the associations between cyberbullying and different variables and discussing with emerging adults their perceptions, views, and opinions of cyberbullying. This information will also inform future measurement in this field. To this end, the research question was to explore how emerging adults (i.e., 18–25 years) define cyberbullying. Participants were recruited through snowball sampling methods such as advertising on SNSs (i.e., Facebook and Instagram), email, information flyers and through the Research Experience Program (REP) where first-year Psychology students gain a course credit for participating in research studies. All individuals interested in participating in the research contacted the researcher via email. The researcher liaised with participants to organize a time to attend a focus group that was conducted in a meeting room on the university campus. Participants were notified of the day, time, and location of the focus groups via email. Participants received a reminder email one week before the session containing details of the focus group. The final sample consisted of 39 Australian emerging adults aged 18 to 25 years (M = 21.33; SD = 2.64) who were invited to attend one of six semi-structured focus groups for approximately one hour to discuss their perceptions on the definition of cyberbullying. Of the 39, 36 were currently enrolled in a university degree and three emerging adults were employed in full-time work. Around five to eight participants were allocated to each focus group, which is consistent with the recommendations of leading qualitative researchers who specialize in focus groups (Krueger and Casey 2009). Focus groups were used to gain a deeper understanding and reveal detailed information about emerging adults’ perceptions, observations, and opinions of cyberbullying. Since emerging adults’ views are largely underrepresented in cyberbullying research, focus groups provide a broader range of responses and several different perspectives on the topic rather than individual interviews (Krueger and Casey 2009). For instance, hearing other participants’ perspectives can allow a participant to clarify or elaborate on their own contributions to the discussion, which may be left underdeveloped in an individual interview (Kitzinger 1994; Powell and Single 1996). Focus groups also provide a non-threatening and more naturalistic environment that encourages discussion among participants, which in turn provides researchers with insight into how participants conceptualize and describe specific constructs (Wilkinson 1998). A semi-structured interview guide was developed for the focus groups. This helped to ensure that the research question was addressed but the facilitator was free to explore and ask more specific questions if needed. Participants were asked open-ended questions relating to the definition of cyberbullying, examples of cyberbullying behavior, the effects of cyberbullying, and the strategies used to cope with cyberbullying (please contact the corresponding author for a copy of the interview guide). This study received ethical clearance from an Australian university Human Research Ethics Committee. Prior to the commencement of each focus group, participants were required to provide signed informed consent. The researchers (facilitator and note taker) introduced themselves and the project and asked if there were any questions before starting the focus group. The facilitator was a registered clinical and counseling psychologist with experience in conducting qualitative research. The second researcher had the responsibility of note taking and asking specific clarification questions when required. All focus groups were held in private meeting rooms, audio recorded, and lasted approximately one hour. Focus groups were audio recorded and transcribed verbatim for further analysis. This study employed a general qualitative framework as only general views and opinions on cyberbullying were collected. That is, other qualitative frameworks (e.g., phenomenology, ethnography, or narrative approaches) were not suited to the aims and research objectives of the current study (see Creswell 2013). A thematic analysis using the coding framework outlined by Braun and Clarke (2006) was conducted whereby the first author read and reread the transcripts in order to become familiar with the content. This was followed by writing notes and highlighting ideas in the right margin of each transcript. The first author started to apply initial descriptive coding to the first transcript and tried to apply these codes to the following transcripts or developed new codes that came out of that group. Once 20–30 codes were developed, the first author defined each code to make sure it was being applied consistently across the data and supporting evidence for each code was given. In addition, similar codes were grouped together to develop overarching themes in which redundant codes were excluded from the analysis. A thematic map was drawn to see how the story fits together (displayed in Fig. 1). The authors employed an iterative process, reviewing codes and themes until there was a shared consensus. The thematic analysis identified emerging adults’ views and interpretations of the definition of cyberbullying (see Fig. 1). In all focus groups, participants described cyberbullying as a complex phenomenon with many layers, though there was a general agreement that it is an extension of traditional bullying (main theme). In particular, participants mentioned that cyberbullying is “bullying via technology” (female, 24; first subtheme), such as “over the [mobile] phone” (female, 19) or “using social media” (female, 24), where “one or more people are essentially bullied” (male, 22) “by a group of people or by one person” (male, 21; second subtheme). The form of cyberbullying behavior (third subtheme) can be indirect (e.g., “making fun of you [on a Facebook timeline wall post] but just talking amongst us but you can see it,” male, 23) or direct (e.g., “send[ing] someone an angry text,” male, 23), which is also similar in traditional bullying. The three key components of traditional bullying, namely intent to harm, repetition, and power imbalance emerged from participant discussions and participants spent a large portion of the focus group trying to define and apply these to cyberbullying. However, when participants delved deeper into discussions about how to operationalize these key components, there was much confusion and debate within the focus groups. For example, one participant (female, 24) who initially stated that cyberbullying involves an intent to harm later expressed, “now I’m confused about my own definition of cyberbullying” when trying to establish this concept from a bystander’s perspective (where the notion of “victim” without “perpetrator” becomes more salient). Interestingly, it became evident that the way in which individuals define these key components depended on the point of view adopted (fourth subtheme). For example, participants said that how cyberbullying is defined “…comes down to perception” (male, 19) and “how you perceive things might be different from the bully’s perspective” (female, 22). The focus group data revealed that there are multiple overarching perspectives when defining cyberbullying such as a perpetrator, target, and bystander perspective (categories), and within these perspectives, there are even more specific types of involvement that need to be considered (Fig. 2), which are similar but also build on those discussed in traditional bullying (Olweus 2001). The definition of cyberbullying from the different perspectives will be the focus of the “Results and Discussion” section. Intent to harm was the main focus in the groups with repetition and power imbalance being spoken about as secondary terms which help establish intent to harm, rather than viewed independently from it. It should be noted that participants were not asked to think about the definition from each perspective (e.g., perpetrator, target, bystander) or asked about their own experiences of cyberbullying from these different perspectives. Rather, this discussion and debate was generated by focus group participants themselves when considering the definition of cyberbullying. A number of participants considered the definition of cyberbullying from the perspective of a bully; however, a thematic analysis revealed that this group falls within a larger category of perpetrators that also encompasses benign bullies. In particular, participants acknowledged that there can be benign bullies, who unintentionally or accidentally harm a target, and bullies, who intentionally try to cause harm to a target. Therefore, participants viewing cyberbullying from a perpetrator perspective argued that the motives of the bully are what is important in classifying cyberbullying behavior, regardless of how successful the bully is in inflicting harm. For example, two participants stated, “from a bully’s perspective…it has a lot to do with intent” (male, 19) or “it comes from the bully’s intent to put you down in some way or another, if you weren’t affected by it that’s great, but the bully still has this intention of wanting to put this person down” (female, 22). This supports previous qualitative research, where young people consider the bully must have intended to harm the victim in order to constitute as cyberbullying (Baldasare et al. 2012; Nocentini et al. 2010; Vandebosch and Van Cleemput 2008). Alternatively, if a bully did not intend to harm a target, then the behavior may not be classified as cyberbullying even if the target interpreted the act that way. For example, participants with this view mentioned, “how can it be intent if you’re not knowing you’re doing it?” (female, 18) or “I question if it’s cyberbullying if there is no callous intent behind it” (male, 20). Baldasare et al. (2012) found similar results from college students who reported that if there was no intention, then the behavior should not be deemed as cyberbullying, even if the victim interpreted it as such. An example of unintentional, accidental, or benign cyberbullying behavior mentioned by participants was when the behavior was in fact intended as humor. For example, “someone might genuinely be teasing or having a joke but the person who receives it may believe that it’s bullying, and it can result in serious emotional damage where in reality it may not have ever been intended that way” (male, 23). Although, there are instances where humor and teasing are used as a disguise for passive bullying, such as “passive aggressive statuses” (male, 23) that “try to get a reaction out of you but without directly telling you” (female, 19). In addition, it may be a thoughtless comment, as one participant (male, 25) described he “said something…just dropped something and then they [receiver] have taken it in the wrong regard and then it’s really hurt them.” Lastly, appropriate behavior, which may be unpleasant for the receiver, could be considered cyberbullying, such as “people who did not want to talk to you so then they’re ‘bullies’” (male, 20). However, participants in the current study highlighted that “if you did find out that person took a rolling [was hurt] and you kept doing it” (female, 22), “then that’s when it goes over [the line from teasing or other benign behavior to cyberbullying]” (male, 21), “because you are now aware of the person’s feelings and how they cope with something like that…that would become an intent to harm that person on your part” (female, 22). As such, rather than apologizing or “debrief[ing] afterwards and say look we didn’t mean it” (female, 19) this repetition helps establish the bully’s intent to harm the victim. In regard to repetition, one participant (male, 21) expressed that for it to be cyberbullying “it would have to happen more than one or two times…I wouldn’t say it would be a once off attack because sometimes you have differences with people.” Another participant (female, 18) also agreed that “…it’s got to be a continuous thing, you can’t just consider it to be bullying if someone says something and you’re upset by it.” These perceptions are in accordance with some participants’ views in previous qualitative studies (Baldasare et al. 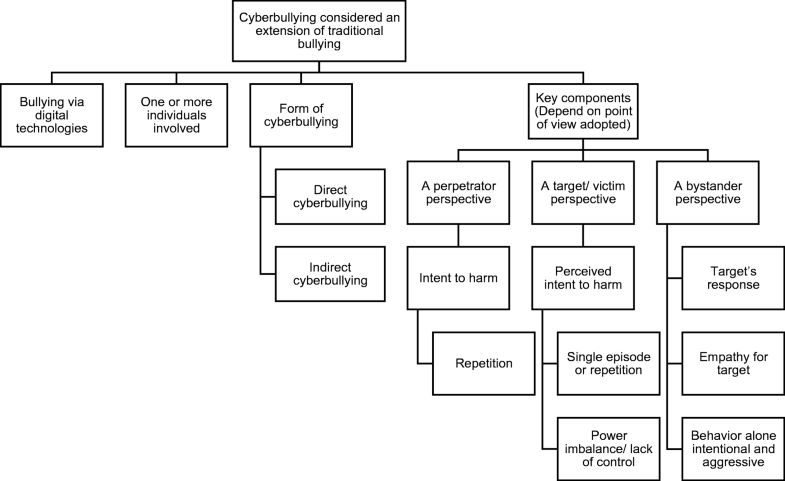 2012; Vandebosch and Van Cleemput 2008) and current definitions of cyberbullying (Smith et al. 2008). However, in the current study, it was not clear from participants’ responses as to whether their perceptions of “repetition” were more general and would change when considering different types of cyberbullying behaviors. For example, when the participant above (female, 18) mentioned “if someone says something,” are they thinking of a direct private text message between the perpetrator and target only, or are they referring to a public comment that has the potential to be seen and read by the target and many other people? It also was not clear from participants’ responses how many times a specific act needs to be carried out to qualify as cyberbullying. These responses highlight the perception of repetition from a perpetrator’s perspective, but also the complex nature of repetition in cyberspace. Typically you will have that distinction between the more powerful individual and a weaker individual either physically or mentally, but you have to look at it more complex because that bully per se could be getting bullied somewhere else and then it’s just a step down progression and the same thing goes the child that is the bullied could eventually go on to bully someone else…In our generation, once you get older if you get bullied by someone else it’s just as likely you bully someone else (male, 24). I’ve had like bantering conversations with friends and I’ve had someone else interject and take it completely out of context and they were standing up for me but there was no need, it wasn't bullying, even a little bit, and he just went like way over the line and started threatening the other person which he went from being the bystander to the bully (female, 19). Taken together, when interpreting cyberbullying from a perpetrator perspective, intent to harm appears to be the central factor and repetition can help establish the bully’s intentions. From this perspective, benign bullying behavior (i.e., lack of intent to harm) should not be classified as cyberbullying, even if the victim was harmed by the behavior. While the bully’s intentions were often classified as premeditated and proactive, it could also be reactive such as in response to previous victimization experiences (bully-victim), or a bystander defending a bully or target, who rather than intervening with assertive behavior, exhibits aggressive behavior with an intention to harm. On the other hand, individuals who defined cyberbullying from the perspective of a target had a different interpretation. A majority of the participants viewed cyberbullying from the perspective of a target, with an emphasis on a victim’s interpretation of the event. It is important to note that participants identified that it means something different to be a target of a cyberbullying behavior versus a victim. That is, a target was viewed more as an overarching category to describe a person who is a target of a cyberbullying behavior and perceives the behavior as intending to harm. The target becomes a victim when the behavior is not only perceived as intentional but is also perceived as inflicting harm. For example, participants agreed that, “I think to be bullied, anyone can be bullied but then to be a victim is another kind of side to it” (male, 19). Another participant (female, 18) further highlighted the distinction between target and victim by disclosing her own personal experience with cyberbullying, “I would still consider it to be bullying but then I don’t consider myself to be a victim,” with another participant (female, 19) adding “it’s bullying without the victim thing.” In addition to this, one participant (female, 19) described “to be considered as a victim you have to be affected by it, you have to be damaged by the bullying as such...you’re not a victim if it doesn’t affect you.” This may explain as to why one-item scales, which ask an individual’s involvement in cyberbullying (e.g., “Have you ever been a victim of cyberbullying?”) have reported lower prevalence rates compared to multi-item scales that list certain behaviors associated with cyberbullying (see Dehue 2013), as to be a victim is interpreted as different from being a target of cyberbullying and this distinction needs greater focus. In general, participants of this perspective argued that, “regardless of intent…it’s really down to the victim [or target]…how they see it” (male, 20). Similarly, another participant (male, 19) mentioned that “the person who receives the message, if they perceive it as bullying then it is bullying because you’ve hurt their feelings.” This finding coincides with previous qualitative studies where participants reported that the target’s interpretation of the incident is the deciding factor in establishing cyberbullying (Baldasare et al. 2012; Dredge et al. 2014). Therefore, in contrast to traditional cyberbullying definitions that have typically comprised key features based on the bully’s behavior (i.e., intention to harm, power imbalance, repetitive), these qualitative findings highlight the importance of also considering the target’s perspective (Dredge et al. 2014). It was also emphasized across each of the discussion groups that, from a target perspective cyberbullying could be considered a “once off attack” as it can result in serious harm for a person. For example, “they might see it, they may deem it as cyberbullying, just from that one isolated incident” (male, 24) as “once it’s on Facebook it’s there forever…the damage is done because everyone’s seen it” (female, 18) and “it can be permanent, people can save that photo or it can stay somewhere online, and you could see the photo of yourself again online and be like that is really horrible, it’s still there” (female, 20). This view is consistent with previous research, which has reported that a singular public act has a similar function to repetition based on the nature of the technological arena in which it occurs (Baldasare et al. 2012; Dooley et al. 2009; Dredge et al. 2014; Langos 2012; Nocentini et al. 2010; Slonje and Smith 2008). Therefore, cyberbullying scales which employ restrictions for the repetition component (e.g., “two or three times a month”) could potentially exclude targets who have experienced a once off attack, even though it was just as severe as multiple mild attacks (Dredge et al. 2014). When there is something that is no longer under your control. If you go to someone, ‘can you stop, it’s starting to hurt my feelings,’ if they say no then it’s out of your control and I feel that becomes cyberbullying because then you’re to a certain degree powerless, or you’ve tried to stop it…and you’re no longer in control of whether it stops or not (male, 23). Taken together, in comparison to the perspective of a bully, other participants stated that if a target interprets a behavior as intentional and harmful, and cyberbullying, then it is cyberbullying. A target becomes a victim if, not only do they perceive the intent to harm, but they also experience the targeting as inflicting harm. From this perspective, a once off attack can be classified as cyberbullying as it may be just as harmful as repetitive attacks. In addition, when the target perceives there to be a lack of control or an imbalance of power this can also help establish cyberbullying and that the bully’s intentions were in fact to harm the target. It is important to note the definitions and main components of cyberbullying are similar for both a bully and target perspective, but the perceptions of intent and harm and what counts as repetition are different. Furthermore, it was only from a target perspective that power imbalance was mentioned as an important feature in defining cyberbullying. The bystander’s perspective further highlights the multifaceted nature of the definition of cyberbullying. Many participants in each of the focus groups identified themselves as being bystanders in cyberbullying and described their opinions and perceptions of cyberbullying based on an observer’s perspective. There was a range of participants in the focus groups that reported that they had been bystanders to cyberbullying. However, they often found it difficult to determine cyberbullying situations because “from a bystander’s perspective…looking at harmful comments that someone has written about or to someone else…it’s hard…because you don’t know in what sense or context they are making those comments” (female, 22) as it “can look really ambiguous from the outside” (female, 24) and “…it is a grey area if you were looking at it objectively” (female, 24). Other participants described, “sometimes I get confused when I see something and it’s not until you read into the comments further and that’s when you realize this isn’t even serious” (female, 20) or think “oh they’ll be right, they probably won’t even take that to heart” (female, 18). Emoticons were said to be helpful in distinguishing between teasing and cyberbullying; however, it was stressed that a target could say they are fine, send a “smiley,” “LOL,” or “haha” when they are actually hurt by the behavior, which further complicates bystanders’ interpretations of the event. Thus, bystanders expressed that “unless I was to maybe ask them…” (female, 24) it’s hard to distinguish if the target has been hurt by the behavior. For example, one participant (female, 24) identified, “I might view something online and if that was me I would be really upset but to that group of friends it was a big joke, so I wouldn’t know if that person was being bullied or not.” The lack of visual and verbal cues creates great challenges for potential bystanders as “you don’t pick up tone or anything, just words…so you’re kind of lost, are they being sarcastic or are they being for real” (male, 22). This is consistent with previous qualitative research where participants expressed that a lack of tone and non-verbal cues can lead bystanders to misinterpret behaviors as cyberbullying, when it is, in fact, a mutual joke between two friends (Baldasare et al. 2012; Van Cleemput et al. 2014; Vandebosch and Van Cleemput 2008). Some people don’t like getting involved in other people’s business. It has a lot to sort of do with the perceived investment I suppose. If you don't have a perceived invested interest or something invested in the current engagement there is no reason for you to get involved because eventually it is just going to cost you something. But say if your partner is getting bullied you’re obviously going to step in (male, 25). A participant (female, 24) in a different group also had a similar opinion that, “either they don’t know these people or feel very far removed from the situation, but then there is probably another type of bystander where if a friend of yours is doing this you actually have some power to intervene.” Thus, disengaged onlookers might become active bystanders to the bully or target when the person or people involved are considered close to the bystander, resulting in a perceived responsibility to help or intervene (Bastiaensens et al. 2014; Brody and Vangelisti 2016; Van Cleemput et al. 2014). However, as discussed under the “Perpetrator Perspective,” participants expressed that a concern with intervening was that it could potentially exaggerate the situation, as the bystander may have misinterpreted the incident or “put themselves in the limelight to potentially become bullied” (male, 21), or become a bully. As a result, individuals may remain passive bystanders or supporters of the bully or target, and refrain from actively intervening or providing support. For example, participants described a passive bystander or supporter of the target as a “person that is more sensitive to someone’s feelings…has more emotional intelligence and knows that it’s actually hurting the person that’s getting bullied and don’t want to contribute to it even though they are watching it” (male, 23). On the other hand, a passive bystander or supporter to the bully was described as “people who agree with it” (male, 19) or who might text message a friend and say, “look at this Facebook fight…so you just go on Facebook and have a look and…you laugh” (male, 18). Despite the uncertainty from a bystander’s perspective of what cyberbullying is, and the specific bystander role an individual engages in (e.g., disengaged onlooker, bystander to bully or target, or passive bystander to bully or target), participants suggested a general set of criteria that can be used to establish cyberbullying from a general bystander perspective. The target’s response to the situation was suggested as an indicator of distress and potential cyberbullying. As one participant (male, 24) described, “you can tell through a chain of comments the reaction by the individual” or when “someone literally says this has upset me” (female, 19). Similarly, Holfeld (2014) reported that when a target reported or responded to a cyberbullying situation, the behavior is perceived by bystanders as being severe if the target has to notify the bully about it. On the other hand, less bystander support is received when targets do not respond to the behavior or confront the bully, as a lack of response tends to be interpreted by bystanders as the behavior not affecting the target. Thus, while bystanders may perceive comments or acts online as subjective, it appears the target’s reaction to the event can help bystanders determine whether a behavior constitutes cyberbullying. Furthermore, bystanders also mentioned that by imagining the experience from a target’s point of view helps with their interpretation of a scenario as cyberbullying. For example, one participant (female, 24) described, “I might view something online and if that was me I would be really upset.” In addition, another participant (female, 24) expressed “there is that [university] Stalkerspace thing I only recently joined…some people comment on there thinking they are being funny but it seems really mean... I wouldn’t want to be the victim of that.” These responses are similar to the findings of Barlińska et al. (2013) who reported that taking the other person’s perspective, such as the target’s, and focusing on the potential negative consequences of cyberbullying reduced negative bystander behaviors. Empathy for a target of cyberbullying has been shown in previous research to influence bystander responses where adolescent bystanders with more empathetic concern are more likely to intervene and help a target (Erreygers et al. 2016; Pabian et al. 2016; Van Cleemput et al. 2014). It should be noted that in Australia, and especially in Melbourne, many of the universities have a Stalkerspace Facebook page which has been created by students enrolled at these universities. The purpose of a Stalkerspace page is to connect students and ask university and course-related questions, though there have been a number of incidents that could be classified as cyberbullying, harassment, and stalking. You don’t actually have to be speaking to that person to bully them, it’s the fact that you can just post stuff about them and all of a sudden there is this huge array of people that can see what you’re saying. It’s not like a personal thing where you have to be in front of them, you can get the reaction from them by just throwing it out for everyone else to see (male, 25). Therefore, multiple perpetrators, the presence of bystanders who endorse the bullying, as well as the nature of cyberbullying behaviors such as public humiliation, may result in the interpretation of these events as serious cases of cyberbullying that require bystander intervention. The relationship between the sender and receiver was also said to provide some context as to whether the interaction between the two parties is friendly banter or cyberbullying. For example, one participant (female, 22) said, “I think sometimes you would look at comments and be like ‘oh yeah it was harmful, I would judge that as bullying’ or ‘oh no, I know those two people and they’re just having a joke’…” Vandebosch and Van Cleemput (2009) found similar reports where the relationship between the bully and victim plays an important role in the way behavior is perceived. Therefore, although there are a number of specific bystander roles, in general, the definition of cyberbullying from the bystander’s perspective is when it is observed that a behavior has negatively affected another person, or that such a behavior would likely negatively affect the bystander if directed toward him or her. A bystander may also perceive the behavior alone as intentional and aggressive. This qualitative study is one of the first comprehensive examinations of cyberbullying from the perspective of emerging adults. The findings showed that emerging adults experienced hesitation and confusion surrounding defining cyberbullying. On the surface, it appeared as though participants generally understood cyberbullying to be an extension of traditional bullying, identifying the key components as intent to harm, repetition, and power imbalance, though the latter two were seen as helping to establish intent to harm, rather than viewed independently from it. When participants tried to elaborate on and operationalize each of these key components in a technology-mediated environment, this appeared to be a difficult task and was highly subjective depending on the point of view adopted (i.e., perpetrator, target, or bystander perspective). While each perspective highlighted similar key components, such as intent to harm and repetition, the interpretation of these was different. Moreover, only from a target perspective was power imbalance mentioned. Therefore, it is evident from responses in the focus groups that the current definition is too simplistic and rather it needs to be multifaceted in order to capture the perceptions and understandings of emerging adults. The current study extends on previous research by focusing on the different perspectives of cyberbullying (i.e., perpetrators, targets, and bystanders) rather than assuming a single perspective, and in turn integrating these perspectives to propose a multifaceted definition of cyberbullying. The current study also extends on a previous published iteration of the multifaceted cyberbullying definition proposed by Alipan et al. (2015), which was based on a review of the previous literature. Focus group data confirm the previously proposed multifaceted definition but also adds to the complexity of the issue, highlighting not only differing perspectives but also different levels of involvement that need to be taken into account when trying to understand cyberbullying situations. As such, this study proposes a revised three-part cyberbullying definition in the following paragraph and suggests this be implemented in future research and practice. Perpetrator perspective. The goal of the bully is to intentionally harm the target. A person is not a bully if there is no intent to harm, regardless of the impact on the target. Repetition can also help establish intentionality and cyberbullying, in which the bully repeatedly carries out a harmful behavior toward the same target. Target perspective. The behavior is perceived as intentional and harmful by the target. A once off attack can also be considered as cyberbullying as the negative impact on the intended target may be just as severe as frequent attacks. Moreover, that single attack can become repetitive even without any input from the original perpetrator through re-posting. When the target experiences a lack of control or power imbalance (e.g., publicly posted content about the target or against the target’s consent), this can also help establish intent to harm. A target becomes a victim if, not only do they perceive that the perpetrator has an intent to harm but also they experience the targeting as inflicting harm. Bystander perspective. It is observed that a behavior has negatively affected another person, or that such a behavior would be likely to negatively affect the bystander if directed toward him or her. A bystander may also perceive the behavior alone as intentional and aggressive. A bystander may not understand the context of certain interactions, and so bystanders may fail to identify cyberbullying or, alternatively, can escalate situations to cyberbullying through their own interventions in situations where the original context was misinterpreted. Importantly, by separating the cyberbullying definition out into a multifaceted definition, different contexts can focus on different perspectives. For instance, the findings from the current study have implications for researchers, legal practitioners, psychologists, and the education sector as a whole. For researchers, as the cyberbullying definition appears to be multifaceted, it is crucial that the current general definition is separated into the different perspectives. Past definitions and measures of cyberbullying have intended to outline and capture an objective account of the phenomenon, though have often defined cyberbullying from a perpetrator’s point of view and not involved others (e.g., Smith et al. 2008). It is assumed that all respondents hold the same view of cyberbullying when answering these measures, but as identified in the current study, the definition and operationalisation of cyberbullying depends on the perspective adopted (i.e., perpetrator, target/victim, or bystander). In this regard, this multifaceted definition means that researchers would have a more valid understanding of what cyberbullying means and what the prevalence estimates represent, rather than assuming all perspectives hold the same view. For instance, researchers could include all three of the perspectives listed above in self-report measures and adapted measures of cyberbullying such as peer nominations and investigate the agreement (or disagreement) between different types of involvement to obtain a more accurate picture of the cyberbullying situation (see Wegge et al. 2016). 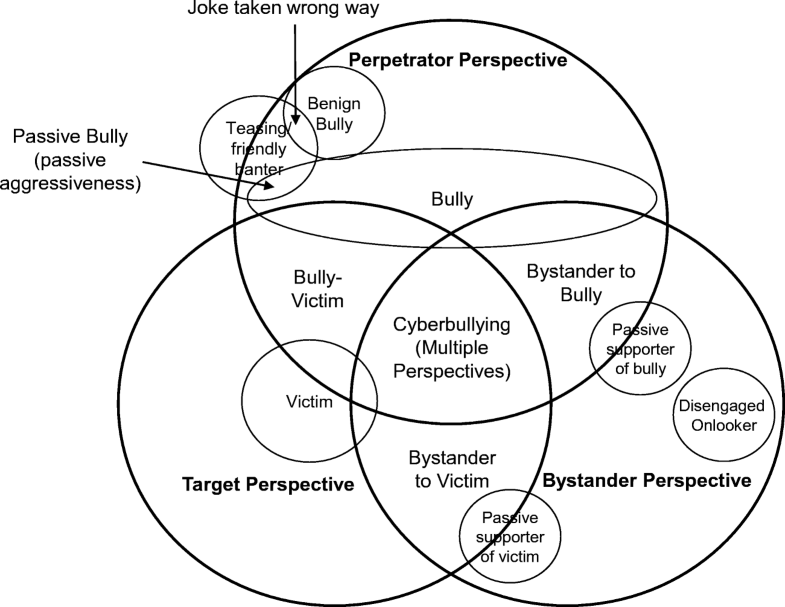 In addition, if researchers were interested in examining a cyberbullying incident from a target (or victim) perspective and the impact of the behavior (regardless of the actual intentions of the perceived perpetrator and bystander perspective), the definition from a target’s perspective, as presented above, could be the focus. Moreover, it emerged from focus groups data that there were differences between being a target of a behavior (no negative effect experienced) and being a victim (negative effect experienced). One past study reported different types of targets of cyberaggression and cyberbullying (e.g., celebrities, close friends, random persons; see Pyżalski 2012) but did not distinguish between the two main involvement types (i.e., target vs. victim), a unique finding in the current study, which can help clarify whether there are differences in psychological outcomes and if this can be attributed to the appraisal of the behavior and coping strategies employed. Therefore, the multifaceted definition treats these individuals as being different. This is especially important when testing theoretical models of cyberbullying where often targets and victims are lumped together and therefore some of the uniqueness of these groups are lost. By participants being able to indicate whether they have been a target with or without being a victim, this can result in more valid examinations and comparisons of similarities and differences between these two groups with other variables, more meaningful conclusions and implications, and, in turn, more accurate recommendations for prevention and intervention programs. Taken together, integrating the perspectives of emerging adults to inform the definition of cyberbullying can allow the operationalization of the term, which in turn would ensure that data on prevalence rates are more valid and meaningful. If there is not a clear recognition of how cyberbullying is perceived from different perspectives, individuals’ responses to self-report questionnaires cannot be accurately interpreted. From a forensic or legal standpoint, intent to harm is a vital aspect of establishing cyberbullying (Langos 2012). As such, the perspective of the bully might be the focus of interest and independently focused on, irrespective of how successful the perpetrator is in causing harm to the target (e.g., perceived harm vs. actual harm), although the target’s perspective as well as the bystander’s may be incorporated to help the perpetrator understand the impact of their actions. It is imperative that professionals working in this area have an understanding of cyberbullying from different perspectives, since the impact on the target is not taken into consideration in legal work unless the behavior of the perpetrator is defined as a crime, they intended it to be a crime, and there is evidence proving beyond reasonable doubt that there was an intention to commit a crime (Campbell et al. 2010). Gathering enough evidence to pursue legal action can be onerous on the target, since the target must experience cyberbullying behavior on more than two occasions, meaning that the target has to suffer in silence during the first or subsequent periods of abuse (Gillespie 2006). However, it is important to note that from a target perspective, the consequences of one attack can be just as severe as multiple low-level attacks (Campbell et al. 2010). From a psychological or clinical perspective, the victim’s perspective may be of interest irrespective of whether there was an intention to harm. From this perspective, what matters is how the individual perceives the incident and reducing distress (e.g., anxiety, depression, low self-esteem) as subjective appraisals of victimization have been found to be more closely associated with current adjustment than actual victim status (McCabe et al. 2010). Although psychologists may use other perspectives (e.g., perpetrator and bystander) to try and improve the victim’s own understanding of the situation, it is also helpful being able to distinguish between being a target and a victim, as the intervention might be different for these individuals. For example, teaching victims effective coping responses and how to appraise cyberbullying situations differently may help to build resilience in this group. This multifaceted definition is particularly important in cyberbullying as there are instances where the perpetrator may be unaware of the emotional impact of their behavior. Therefore, psychologists can also work with the perpetrator to help them understand the consequences of their actions on the victim and develop empathetic responses to deter future cyberbullying behavior. From an education perspective, the bystander perspective may be of initial interest as bystanders are assumed to act as objective arbitrators and can decrease bullying and increase support for victims (Pozzoli and Gini 2010). However, while the idea around bystander interventions is to affect the behavior of the bystanders, many individuals who witness bullying do nothing to intervene and stop it (Pepler and Slaby 1994). Based on the findings of the current study, this may be attributed to the difficulty in determining whether the behavior is cyberbullying, or being fearful he or she will be targeted once intervening or that they will create a drama where none currently exists by interfering with peer banter. This is concerning as this means that the first two stages of the Bystander Intervention Model (Latané and Darley 1968; Latané and Darley 1970), notice the event and interpret the event as an emergency, are potentially not being met and that the subsequent stages of the model, such as accept responsibility to intervene, decide how to help, and perform the intervention will not be engaged in (Latané and Darley 1968). As such, the current study has provided criteria, which can be built into interventions and programs to help bystanders identify cyberbullying situations, and thus meet the first two stages of the Bystander Intervention Model, so they can progress through the model and intervene safely. This can empower bystanders to not only take a stand but also provide them with the knowledge and resources on how to appropriately mediate difficult situations without amplifying them or placing themselves at risk for victimization. In addition, it is also vital that there is a balance of all three perspectives when developing cyberbullying interventions to promote healthier environments such as more resilient victims, more empathetic development in bullies, and more educated bystanders so incidents do not escalate to a point that they become cyberbullying and thus a criminal or clinical matter. Taken together, professionals in different contexts may be interested in particular perspectives, and that it is important when reporting instances of cyberbullying that it is made clear which context and perspective this experience is being viewed from. Understanding this context offers one solution to the problem proposed by Corcoran et al. (2015) where intent to harm, for instance, is considered a key characteristic of cyberbullying, though it is less clear whether the perpetrator (actual intent to harm) or target/victim perspective (perception of intent to harm where there may or may not be any) is more important. Furthermore, incorporating the other perspectives, if possible, can be used to gain a more comprehensive understanding of the event or situation and determine whether or not it is in fact cyberbullying. The findings in the current research should also be used to develop educational programs for emerging adults in educational and work environments as most awareness campaigns and prevention strategies have been aimed at helping children and adolescents make sense of and respond to traditional bullying from a single perspective. One limitation of the study was that while some participants expressed that they had personally been involved in, or witnessed, cyberbullying, the facilitator did not directly ask about the personal experiences of emerging adults. This was to protect participants from potentially disclosing distressing experiences and to avoid legal ramifications associated with cyberbullying. However, participants may have been responding with how they think the different perspectives interpret a situation without actually experiencing it firsthand themselves. It should be noted that there were a few participants in each group who did describe their own personal experiences of cyberbullying, though this was to provide an example or clarify a point rather than to vent about it. In the future, researchers should consider gathering more generic negative behaviors online and then ask participants whether any of these instances are cyberbullying behaviors (see Ging and O’Higgins Norman 2016). This approach may capture problematic behaviors that participants do not include in their definition of cyberbullying and at the same time provide some insight into which perspective these online behaviors are being interpreted. Since there is a lack of consensus on the definition of cyberbullying and limited research on emerging adults, it is crucial that researchers understand what cyberbullying means to this age group. Data from the focus groups suggested that emerging adults perceive cyberbullying to be an extension of traditional bullying, as it comprises similar key features (i.e., intent to harm, repetition, and power imbalance). However, when attempting to operationalize the term and the key components, this was highly subjective and dependent on the point of view adopted. Therefore, this study has incorporated emerging adult perceptions to develop a multifaceted cyberbullying definition from the perspective of perpetrators of potentially bullying behaviors, targets of perceived bullying behaviors, and bystanders. By breaking the definition down into the multiple perspectives, in different contexts (e.g., research, legal, psychological, education), there can be a focus on different perspectives or all perspectives to help gain a better understanding of cyberbullying. Alipan, A., Skues, J., Theiler, S., & Wise, L. (2015). Defining cyberbullying: A multiple perspectives approach. In Annual review of cybertherapy and telemedicine: Virtual reality in Healthcare: Medical simulation and experiential interface (Vol. 219, pp. 219, 9–13). https://doi.org/10.3233/978-1-61499-595-1-9. Bauman, S. A., Underwood, M. K., & Card, N. A. (2012). Definitions: another perspective and a proposal for beginning with cyberaggression. In Bauman, S. A., Cross, D., & Walker, J. Principles of Cyberbullying Research: Definitions, Measures, and Methodology (pp. 41–45). Taylor and Francis. https://doi.org/10.4324/9780203084601. Campbell, M. A., Cross, D., Spears, B., & Slee, P. (2010). Cyberbullying: legal implications for schools. The Centre for Strategic Education, 118. Retrieved from https://eprints.qut.edu.au/40772/1/COVERSHEETC40772.pdf. Campbell, M., Whiteford, C., & Hooijer, J. (2018). Teachers’ and parents’ understanding of traditional and cyberbullying. Journal of School Violence, 1–15. https://doi.org/10.1080/15388220.2018.1507826. Olweus, D. (2001). The bullying circle. Bergen, Norwegen. Retrieved from: http://schools.hcdsb.org/mich/Safe%20Schools/Bully%20Circle%20Handout.pdf. Pepler, D. J., & Slaby, R. G. (1994). Theoretical and developmental perspectives on youth and violence. In L. D. Eron, J. H. Gentry, & P. Schlegel (Eds. ), Reason to hope: a psychosocial perspective on violence & youth (pp. 27–58). https://doi.org/10.1037/10164-001.